Insurance with up to 15% discount for Club members. 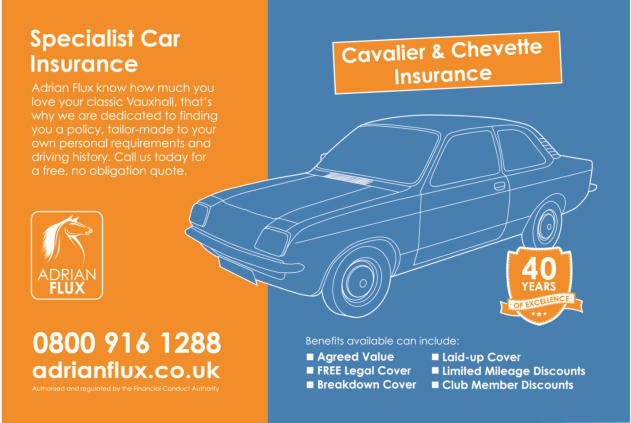 Adrian Flux Insurance Services are pleased to announce their association with the Cavalier and Chevette Club and all its members who enthusiastically support the Club. We are able to offer up to 15% discount on policies for Club Members and would welcome modified car drivers, young drivers and convicted drivers. Why choose Adrian Flux Insurance Services? For the past 40 years Adrian Flux Insurance Services has developed into one of the country's leading brokers for Specialist Motor Insurance, providing services dedicated to the specific needs of our clients. This enables us to offer all drivers competitive premiums and excellent service coupled with special discounted rates for Car Club members. Our 'specialist' schemes enable us to provide very competitive premiums and added benefits such as free legal cover. Call today on Freephone: 0800 089 0035 or Click-through on the banner for a quote. Please state that you are a member when you call for the discount.